We can all look back at the family celebrations of our childhood and have something that stands out as a lasting memory. I am a foodie at heart and most of my fondest memories revolve around food. Seriously. Depending on whose house we were celebrating at, there are always one or two special dishes that I can remember a household by. Those memories of food make me warm and cozy inside and have been the inspiration for many of the recipes I create, or mimic. Christmas for me at my paternal grandparents was all about one thing. The second I walked into the door I gave my kisses and hugs, escaping as quickly as possible to the table that was always set up in the living room, with the crock of grandpa’s famous, even if only to me, Pimento cheese. This is were I would stay until I was so full my belly ached or my parents pulled me away so that I would have room for dinner. My grandparents were from a small town in Ohio, named Logan and my grandma came to California with the recipe in tote. Where it originally came from we aren’t quite sure. 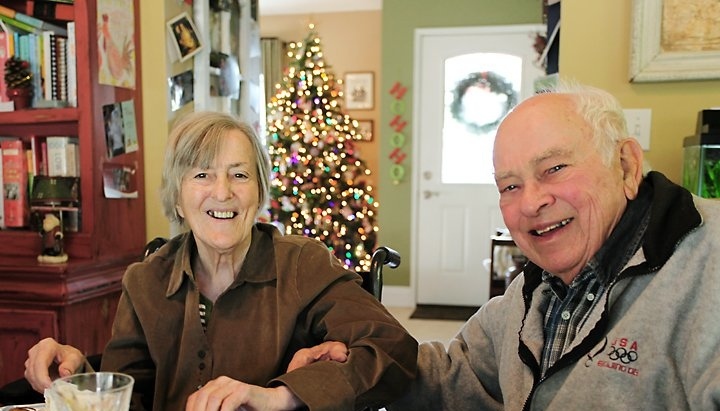 Over the years, grandpa began making it as his contribution to the Christmas meal. As a child I only knew it as grandpa’s recipe, which is especially odd, because I have no recollection of ever seeing him in the kitchen doing anything, aside from getting a beer. Christmas dinner 2013 was at my parents. My mom and daughter had been working on a top-secret surprise a few days before, that I wasn’t allowed to know about. 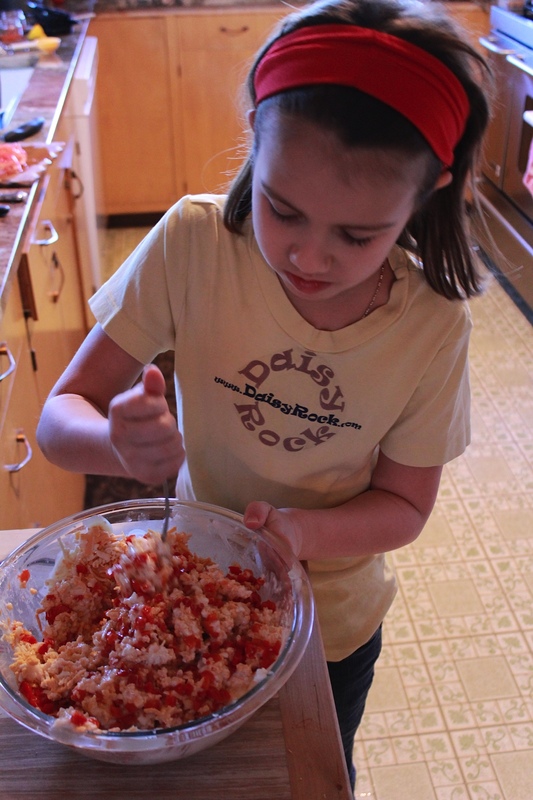 With the help of Daiya cheese, my mom was able to recreate my grandparents Pimento Cheese. It seriously brought tears of joy to my eyes and I think I alone ate half of the crock by myself. I did however take a break to teach my daughter to stuff it in the hole of a black olive, for the ultimate Pimento cheese eating experience. Best Christmas gift ever! My mom has been kind enough to allow me to share this recipe with all of you. If you have the opportunity to give it a try, I hope you enjoy it as much as I did! *Do not use the shredded Daiya because it is too dry. You need to use the wedges and grate it yourself. *This was my grandparents recipe. A dash equals one shake of the container. *You could never have a meal at my grandparent’s house where Lawry’s wasn’t on the table. In fact, my uncle wouldn’t even taste a meal without sprinkling it all over is food. This is the seasoned salt used in the recipe. I am sure any would work, possibly altering the flavor a bit. I am thinking Himalayan salt would work well. Mix all ingredients together so it blends like a spread. Stuff into a crock or canning jar. Seal and allow it to set for a couple of days before serving. Works great with bread, veggies, crackers or olives. Anzia making the special cheese. 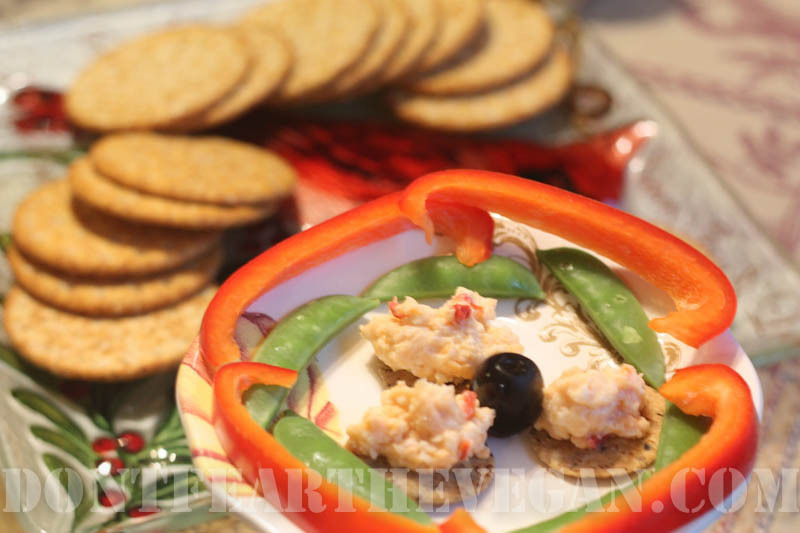 Gallery | This entry was posted in appetizer, Gluten Free, Mom's Recipes and tagged cheese, daiya, gluten free, vegan. Bookmark the permalink. Hi Jenny! Wow! It is rare to meet someone that knows where Logan is. My Great Grandfather owned a bakery in Logan way back when and the building with the Schmitter name is still there. My grandfather went to college in Athens. The internet makes this world even smaller. Thanks for sharing!! I never thought if have this again, since going vegan…give your mom a hug from me. I used to spread pimento cheese on bread and simply eat the most delicious (and fairly inexpensive) sandwich ever. Yours will cost a bit more, but it’s so worth it considering the alternative. Your message came through while we were having dinner at my parents. It made them so giddy. I was as excited for you as I was for myself! My grandpa would always send me home with a small jar of the cheese for myself and my favorite way to eat it was on two slices of bread. I had completely forgotten about that until you mentioned it. My mom is making more for the big game this weekend and since I can’t be there she promised to save me some. I now plan on eating it in a sandwich! I am so happy to have found this recipe. I LOVE celery, and this would be perfect to serve this weekend for the Super Bowl. Thanks for sharing! I don’t use Daiya wedges because they contain palm oil – do you think this’d work with Daiya’s shreds. You may have to use more mayo, but I think it would work.